Cystine is one of the sulfur-containing amino acids; therefore, the urine may have the characteristic odor of rotten eggs. Urinalysis may show typical hexagonal or benzene crystals, which are essentially pathognomonic of cystinuria. Microscopic crystalluria is present in 26%-83% of patients. Disappearance of cystine crystals in the first morning urine is a good index of treatment efficacy. Daudon et al calculated the cystine crystal volume (Vcys) from microscopic analysis of early-morning urine to predict stone recurrence. Patients who formed stones recurrently had an average Vcys of 8173 µ3/mm3, versus 233 µ3/mm3 in those who did not form stones. The absence of cystine crystals or a Vcys of less than 3000 µ3/mm3 was associated with the absence of cystine stone formation. The presence of multiple crystals (>20/mm3) and a Vcys of more than 3000 µ3/mm3 was predictive of stone recurrence. The measurement of Vcys is helpful in assessing the effect of any treatment schedule. Daudon et al reported an average Vcys of 12,000 µ3/mm3 in untreated patients, 2600 µ3/mm3 associated with conservative therapy, 1141 µ3/mm3 in patients with high fluid intake receiving mercaptopropionyl-glycine therapy, and 791 µ3/mm3 in patients with high fluid intake receiving penicillamine therapy. The sodium cyanide–nitroprusside test is a rapid, simple, and qualitative determination of cystine concentrations. Cyanide converts cystine to cysteine. Nitroprusside then binds, causing a purple hue in 2-10 minutes. The test detects cystine levels of higher than 75 mg/g of creatinine. False-positive test results occur in some individuals with homocystinuria or acetonuria and in people taking sulfa drugs, ampicillin, or N -acetylcysteine. In persons with Fanconi syndrome, a false-positive test result can result from generalized aminoaciduria. The normal excretion rate is 40-80 mg/d (0.166-0.333 mmol/d). Heterozygotes excrete 200-400 mg/d (0.8-1.7 mmol/d). Homozygotes always excrete 600-1400 mg/d (2.5-5.8 mmol/d). Other metabolic abnormalities that can be deteded on a 24-hour urine collection are hypercalciuria, hypocitraturia, and hyperuricosuria. Results may help define a subgroup of patients at risk for failure of medical therapy due to the formation of noncystine or mixed calculi. Urine proton nuclear magnetic resonance spectroscopy is a very powerful technique that allows multicomponent analysis useful in both diagnosis and follow-up. As reported by Pontoni et al in 2000, the relevant amino acids can be detected in the urine of patients with cystinuria. The most abundant amino acid in these patients is lysine (>5 mmol), whose typical signals become very high. Cystine, arginine, and ornithine are usually detectable, although pathologic concentrations are lower (< 2 mmol). The nuclear magnetic resonance spectroscopy technique is also suitable in the follow-up of therapy with alpha-mercaptopropionylglycine (alpha-MPG) because it provides quantitation of cystine, citrates, and creatinine, thus allowing better monitoring. Heterozygotes show a high level of lysine, and spectroscopy provides a very easy preliminary identification of this group. 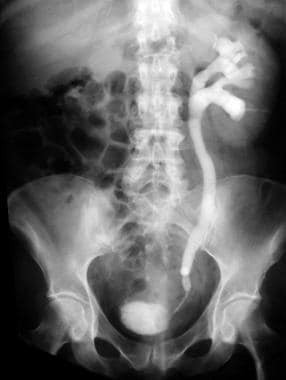 Calculi are frequently multiple and bilateral, and they often form staghorns. Images from these studies may show faintly radiopaque calculi that become radiolucent with intravenous contrast materials. 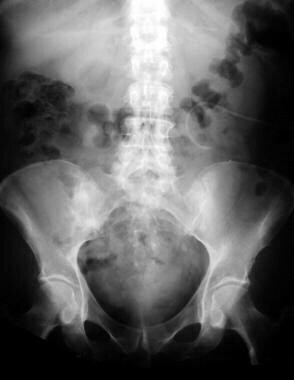 Cystine stones have a homogeneous or ground-glass appearance on radiographs (see images below). Although radiopaque, they are often less dense than calcium-containing stones. Intravenous pyelography is essential for defining calyceal anatomy prior to extracorporeal shockwave lithotripsy (ESWL). 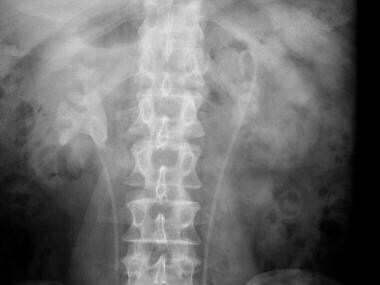 The stone burden, including calculi, is difficult to accurately visualize and assess on plain radiography. Helical CT scans are ideal for patients with contrast allergy or renal insufficiency. 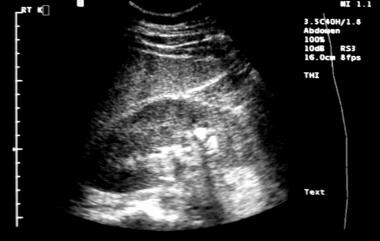 Renal ultrasonography (see the image below) is more economical than CT for monitoring the growth of renal calculi. Moreover, the lack of radiation exposure makes this test ideal for children and patients with frequent recurrences, who would otherwise accumulate relatively large radiation doses over a lifetime. Jejunal biopsy was once used to distinguish among 3 subtypes of cystinuria. This procedure is not recommended as part of routine workup and is primarily a research tool. Cystine stones are pale yellow. 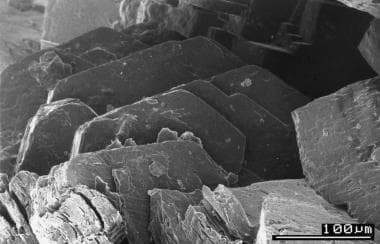 Electron microscopic evaluation coupled with x-ray diffraction crystallography has been useful in identifying stone components and specific spatial relationships of stone components (see image below). Pure cystine stones are observed in 60%-80% of cases. Two subtypes of cystine calculi have been identified by electron microscopic evaluation of stones removed from persons with cystinuria: rough and smooth. Smooth calculi have an irregular, interlacing crystal structure, making them more resistant to ESWL fragmentation than the more homogenous hexagonal crystal structure of the rough subtype. Unfortunately, clinically differentiating the two types before ESWL is not possible. Of patients, 20%-40% have cystine mixed with calcium oxalate, calcium phosphate, or magnesium ammonium calcium phosphate.